Right before I left for Las Vegas, all my winter dreams came true. 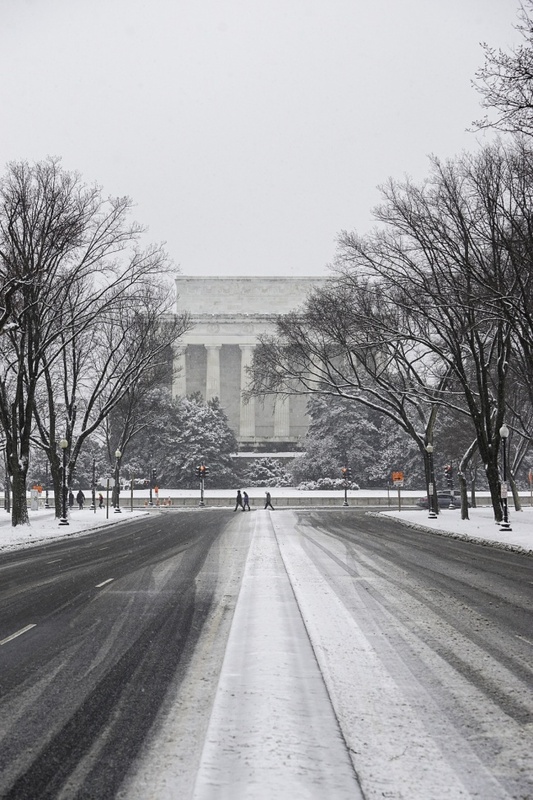 We finally got a decent amount of snow in the Washington DC area that I was able to photograph. 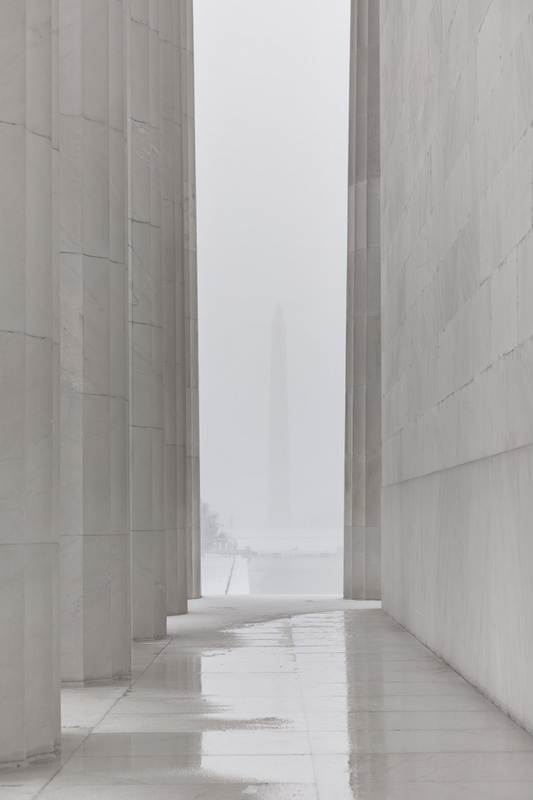 I think one of my favorite things about photographing the snow in the national mall is the white on white that you get from the snow with the memorials. It just makes everything look so calm and monochromatic. The only way that you can tell that this is a color image is from the street signs. LOL. The best part is that the snow doesn’t stop people from getting out there and exploring. You know what, I even saw runners and bikers on bicycles out in the snow. You can never say that the people in Washington DC aren’t dedicated. LOL. This is an image that I’ve been planning for a while now. I’ve actually taken quite a few images from this spot but I don’t know if I’ve ever published any of them. They’ve never been exactly what I’ve been looking for. 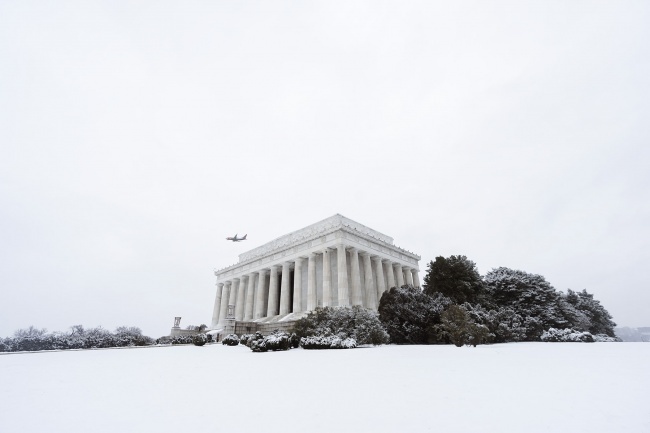 But in this particular image, I love all the snow on the ground with the tire tracks that are acting like leading lines directly to the side of the Lincoln Memorial. I saw those people crossing and purposely waited for them to be in the middle. I guess just a small detail that makes the image just a little more interesting. I love how it adds a little bit of scale as well. Even though it just lasted one day, I’m glad I was finally able to capture some this winter season 🙂 But to be honest, I’m about ready for spring now. My camera settings for this image is with my Sony A7II F4.0 at 1/2000th sec and ISO 800 with my Sony A7II and 70-200mm ultra zoom lens. The first part of the trip will be spent in Joshua Tree National Park. We got this cute airbnb that has a really nice yard. I know Frankie will love it. Please let me know if you have been and have any recommendations for what to do there. It will be all of ours first time in the park and really looking forward to some fresh air. The rest of the time will be spent in San Diego. I plan on capturing all the sunrises and sunsets I can but also catching up with friends that we haven’t seen in a year. Since our trip last year, I have definitely learned the types of images that I want to capture while in SoCal. I’m so looking forward to exploring even more. That’s me on the airplane flying away from the cold. LOL. My camera settings for this image is F5.6 at 1/30th sec and ISO 100 with my Sony A7II and 16-35mm wide angle lens. The second day of spring and we finally get some snow. So funny how that happened. But I welcome you, snow with open arms although you should have come last week. But it’s whatever. I’ll take what I can get. I was so excited to get out there and shoot. I’ve been waiting for this day for about 3 months now and it finally happened. I met up with my friend, Paul, and we decided to head over to the US Capitol and check out the scene around there. 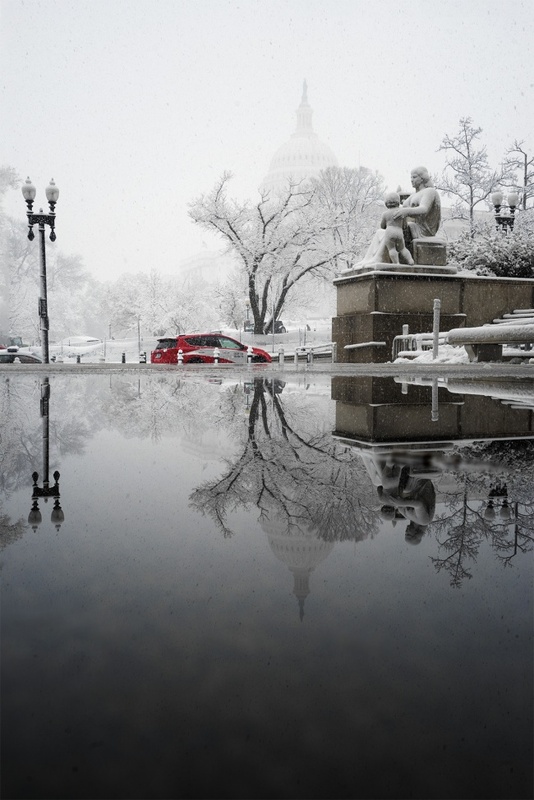 I had seen some people posting images of the Capitol dome and cherry blossoms so I wanted to see if we could find them to see what they looked like in the snow. Mission accomplished. I’ll post an image of them soon. After walking around for a while, Paul and I headed to the Rayburn House Office Building to warm up a bit and use the facilities since the US Capitol was closed. While walking around I noticed a whole bunch of men in suits looking at me. Then I realized, oh, they must be looking at my sweater that said “Mo’ Money Mo’ Puppies”. Which I feel like is a great motto to live by. So as we were walking out I spotted this beautiful puddle right outside of the building. I knew I had to capture this image quickly because I really wanted to have a pop of color and the red taxi cab was driving by. I love how it turned out and it was totally by luck. One good thing about this snow is that it should not effect the cherry blossoms. One bad thing about the snow is that it may kill off the magnolias that were already starting to bloom 🙁 That makes me so sad. I didn’t get a really good opportunity to photograph them. Next year, magnolias. For sure. My camera settings for this image is F11 at 1/125th of a second at ISO 200 with my 16-35mm wide angle lens and Sony A7II. I didn’t take this image this past Saturday, I took it a couple years ago but it is still one of my favorite snow images I’ve taken. There are so many things going on in this image but its still so simple. I love the white on white tonality. I also really enjoy how you can barely see the Washington Monument. But my favorite part is seeing the little bit of reflection on the floor surface of the Lincoln Memorial with the little puddles of water and snow blocking the entirety. I think it’s little details like that make the image so interesting to look at. But what do you think? Would you rather have one more good blanket of snow? or are you ready for spring flowers? I think I could go for one more snow day. But please keep it in February. 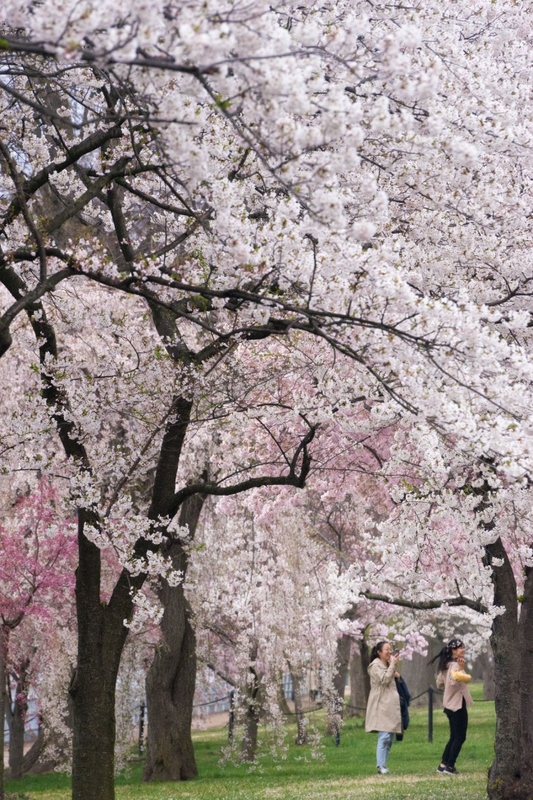 I don’t want them messing with the Cherry Blossoms again like it did last year. My camera settings for this image is F7.1 at 1/125th of a second at ISO 100 with my Canon 5D Mark II and 24-105mm lens. LOL I told you this was an older image. You know because I shot this on my Canon. Which is funny because recently I’ve had quite a few people asking me about switching camera brands. To be honest, I love my Sony and I can’t imagine ever going back to Canon. No offense to Canon but that camera is just a beast. Its so big and bulky and after a while it just got to be too much to carry around on my back. I’m so happy with Sony. I love how easy and free I feel with my camera now. I really can’t imagine shooting with any other camera other than a mirrorless one. I’m hooked! Before the National Museum of African American History and Culture opened, the National Museum of American Indian used to be the museum in Washington DC that was rated with the best food. It is also the only reason why I’d ever been to the museum. For the food. Try the fry bread! Yummm. But over the weekend last week, Andrew and I found ourselves in the city with some time to kill. Luckily, I’ve started to get into this habit where I’ll bring my camera wherever I go. I used to leave it home and only take it out whenever I knew I was shooting. Lately, I’ll take it out whenever I know I’ll be out of the house for a while. You never know when a photo opportunity will hit! So I had my camera in hand and we headed over to the National Mall. By luck would have it, the parking spot we found was closest to the National Museum of American Indian, so we decided to go in. Man, was I really missing out by heading straight to the cafeteria and not looking around. 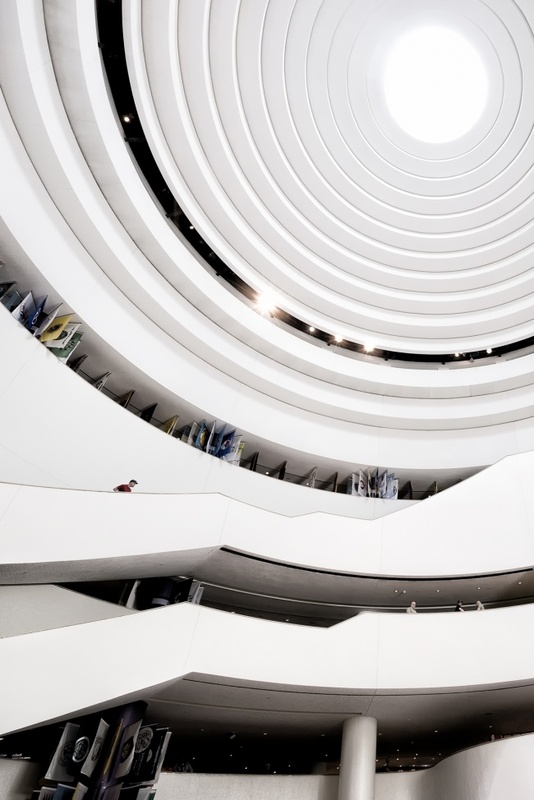 The architecture inside and out is beautiful and the exhibits were interesting. We didn’t get to see it all but enough so that I’d want to come back and spend more time here. I feel like a majority of the time, I was just looking up. I was excited to go to the top floor and check out what the ceiling looked like from every level. Is that weird? It sort of reminds me so much of the New York City Oculus. Anyways, if this was brand new to me, I’m sure there are many more interiors that I’m missing out on in DC. Looking forward to checking out more. If you have any recommendations, let me know!